Electronics Costs > How Much Does an Escalator Cost? How Much Does an Escalator Cost? An escalator is an electric power-driven, nonstop moving flight of steps meant to transport pedestrian traffic up and down short distances. Despite his lack of a working model of the design, a patent solicitor by the name of Nathan Ames is credited for holding the patent of the first escalator in 1859. His invention, which was then called the “revolving stairs,” had steps mounted on a continuous belt. Today, the escalator is such a common sight that people rarely even think about its history or the cost. 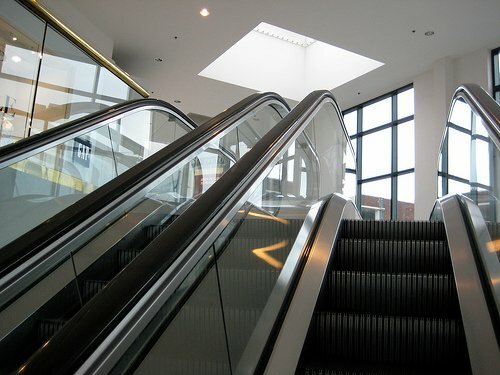 Escalators are commonly used in shopping malls, department stores, transit systems, airports, hotels, convention centers, and other public buildings. Although an elevator can do the same job, transporting people from floor to floor, it is sometimes impractical and takes too long. An escalator, however, can continuously transport people without having to wait. Depending on the size/height of an escalator, the average escalator can be within the $125,000 to as much as $325,000 installed. Standard escalators, today, usually cannot be any taller than 60 feet; however, these regulations may vary depending on your location. The size is usually the main factor. By the foot, an estimate based on data gathered online, the cost could be between $4,000 and $8,500. For example, an escalator that is 30 feet tall could cost $120,000 to $255,000. As for the parts for an unassembled escalator, the costs can be about $20,000 to $35,000 for your average sized escalator. Studies show that thousands of the existing escalators are already more than 20 years old and are in need of updating for several significant reasons. Moving parts that have worn out over time are considerably expensive. Maintenance and repairs will have to be in an annual budget. One of the extra costs you must remember is that you will always need escalators in sets of TWO – you need one that takes passengers up and another that takes them down. Owners of escalators may need to update with new technology to improve their devices’ efficiency over time. Owners and design consultants can either update old escalators with direct replacement or complete modernization of the said transport system. Hiring these consultants can cost upwards of $100+ an hour. Removing and replacing old escalators can be a big project since they have become part of the foundation of a building structure and this requires a considerable budget. Working on the escalators may temporarily impact your business; since it will be harder to travel, there may be people who avoid the building until the construction is complete. Aside from costs of a new escalator, an owner may also have to pay for city impact fees, architect design fees, insurance, and other related expenses. According to HVS.com, escalators are known to consume 45,000 kWh of electricity. This is compared to the average United States home that only consumes 11,500 kWh. An escalator is powered by a continual speed alternating current motor and has a maximum angle of inclination of 30 degrees to the horizontal floor with a regular rise up to about 60 feet. The escalators today have single-piece aluminum or steel steps that run along a system of tracks in an uninterrupted loop. There are some devices called “people movers” that are basically a flat escalator, making the floor beneath your feet move with you. These are often used in airports and can accelerate the rate at which people travel through the facility. Escalators are specifically designed to last long, even longer than most other transportation systems available today. Escalators should be checked for maintenance at least once every six months to ensure the safety of passengers; otherwise, it may cause injury. Through the years, escalators have seen significant improvements in step and handrail drives; and new technology has considerably reduced its electricity consumption. Since many of the existing escalators are already more than twenty years old, designers are encouraged to make the choice of either to replace or modernize the device in order to provide the best overall value for their clients. Escalators cannot replace elevators in your building; elevators are still necessary to accommodate those with a physical handicap. Owners and design consultants have to evaluate which type of update is applicable to certain escalator condition. The issue here is not solely on monetary savings, but it also includes viability and reliability of the new equipment. New motors and drivers appear to require less electrical usage. Hence, owners may be able to cut on their electrical expenses by upgrading to a newer version of the machine.